Semi automatic espresso machines offer a great compromise between giving you control over each shot, while still doing much of the work for you. Which means that you have many choices if this is the type of machine you want to buy. However, all of these choices can be overwhelming, especially if you haven’t purchased an espresso machine before. Fortunately, a few of these machines stand out from their competitors and have become fan favorites. 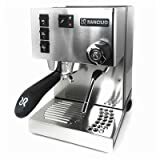 If you’re an espresso connoisseur who wants to get the perfect cup every single time, look no further than one of the top-rated semi automatic espresso machines shown below. Before you choose a semi automatic espresso machine, it’s important that you understand a bit about how they work, and how to distinguish them from the super automatic. This will help you make sure that a semi-automatic is right for you, and will help you know exactly what you’re buying. Basically, semi automatic espresso machines allow you to turn the pump on and off. Each machine has a switch, which allows you to determine the flow of water for each and every shot of espresso that you make. This gives you a lot of control because, after all, the amount and speed of water flow determines how each shot tastes. Most semi automatic machines also require you to grind your own beans and add any milk or flavorings on your own (which some super automatics will do for you). This gives you even more control over every cup, because you can flavor it to taste. This machine has become a fan favorite, and not only for it’s brushed stainless steel color. It doesn’t only look good, but it makes good coffee, too. 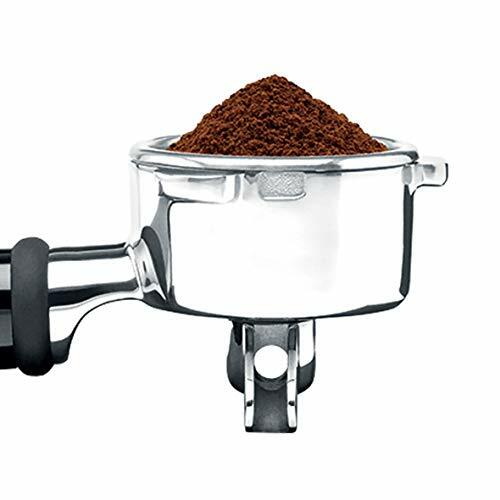 In addition to the stainless steel housing, which resists moisture and other contaminants, it has brass portafilters and a brass grouphead, which helps keep the temperature stable. Its 72-ounce water reservoir means you can make quite a bit of coffee without a refill, and the fact that it’s removable means it’s easy to refill and clean. This machine comes with both a single- and double-shot stainless-steel filter basket, a tamper, and a measuring scoop, too, so you have all the accessories you need in the original box. This machine is also relatively small, which means it can fit into most kitchens. At 14 1/4 x 8 x 9 1/2 inches, it won’t eat up your counter space like other machines might. This machine also comes in brushed stainless steel, so it will look sleep and chic in any kitchen. This particular model was updated in 2009, so is the latest in the line of Rancilio Silvia Espresso machines. Many customers prefer the Silvia to other machines because it has a powerful brass boiler and a pump that doesn’t break down. While you may pay more initially for this machine, you won’t have to replace or repair it like you might have to do with others. This particular model has been upgraded in several ways. The steam wand is of professional grade and articulates fully. It features a 1-hold tip, so your milk will be frothier than ever before. The steam wand also has an ergonomic grip, so it’s much simpler to open and close. Similarly, the heavy-duty porta-filter also has a new ergonomic handle, so it’s easier to wield, too. Many customers purchase this machine and fall in love with the brand, to the point that they choose new models of the Silvia whenever they want to buy a new espresso maker. This is a great machine for first-time espresso machine buyers. If you’re not sure you can handle one of these machines, rest assured that this one is nearly fool proof. In addition, its pretty, with a black and stainless-steel exterior that will fit into any kitchen. Especially easy to use is the transition selection dial, which allows you to move from brewing espresso to frothing milk without a hitch. It also has an automatic cappuccino system, to make sure your milk froths exactly as you want it. When it comes to technical specs, this machine excels there, too. It has a 15-bar pump, to make quality espresso. It also features a thermo block heating element, which ensures that the water is at the best temperature/pressure for espresso extraction. Finally, this is a practical machine, too. It’s 32 ounce water tank is removable, so you can fill and clean it easily. It also has a drip tray that is removable, so you don’t have to worry about having espresso all over your counter. And for those days when grinding coffee sounds like a chore, this machine will also hold a singles, doubles, or pods, to make your espresso-making even simpler.